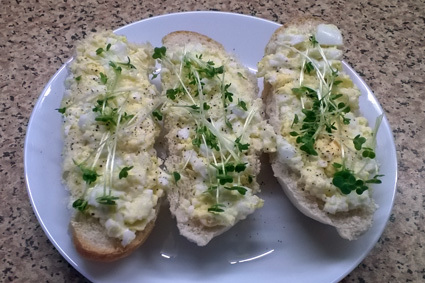 Bridge rolls with mashed boiled egg, mayo, salt and pepper and topped with cress. These bridge rolls were the ubiquitous children's party fare in the 1950/1960/1970's, along with ham and a slice of tomato, grated cheese, and a potted spread, usually beef, bloater (ugh), chicken or salmon. Jelly and set custard or blancmange, a trifle if lucky, sliced swiss roll and maybe another cake. I remember having sausages on sticks, cheese and cocktail onions on sticks, crisps and fondant fancies when older. Does anyone remember eating this type of food at a party? Needless to say, they weren't quite the same, probably because originally, the eggs would have been mashed with salad creme rather than mayo. Egg and cress was one of my favourite fillings - still is, although now I prefer watercress. *Note to self, put salad cream on shopping list! (I loved it, haven't had it for years). We have salad creme when eating out on walks, if mayo isn’t available. Don’t think the recipe has changed much, unlike sandwich spread which is now horrible. That looks like what americans call egg salad, one of my favorites. I remember ham spread, fish paste and the beef which I hated even when my mother attempted to dress it up with pickle. I remember them well. Mum used to make sandwiches like that too and we loved them. And yes - salad cream which I still love to this day. I must be old fashioned as whenever we have a family gathering I still serve that sort of food😊. I also add cheese & pineapple on sticks (stuck into a foil wrapped potatoe). I absolutely adore salmon paste as well - has to be on white bread though with lots of vinegar. Our 3 grown up children and their partners all eat a weird and wonderful array of foods but when they come home for a "spread" as we call it, there's not usually much left. We had something similar for supper last night. What we call egg salad sandwiches, Chopped up eggs with mayo, salt and pepper on very fresh bread. We had it with cream of leek soup. Delish. Yes I remember that sort of party fare. I hated parties, doing my best not to go! One of my favourite fillings was sandwich spread but I agree with you either my taste buds have changed or it has; it's very vinegary now. My mother used to make date and apple sandwiches. Fruit cocktail was another pudding I remember. I must admit that I’m glad I’m too old to eat children's party food now! We always had salad cream and never mayo. Yes I remember all those foods. I still enjoy salmon or crab paste when I can find it! Don't forget Party Rings biscuits! Am I the only one who loves bloater paste? Another favorate is pilchard. Love the stuff! All sounds familiar and all still family favourites when we visit my parents. My favourite paste was always salmon or crab. Obviously good memories all round. Never had salmon or crab paste although we did have pink salmon or red on special occasions. Yes I remember having those things at my party’s when I was growing up. I agree they don’t taste the same now though. I guess you could be right about the mayo instead of salad cream.